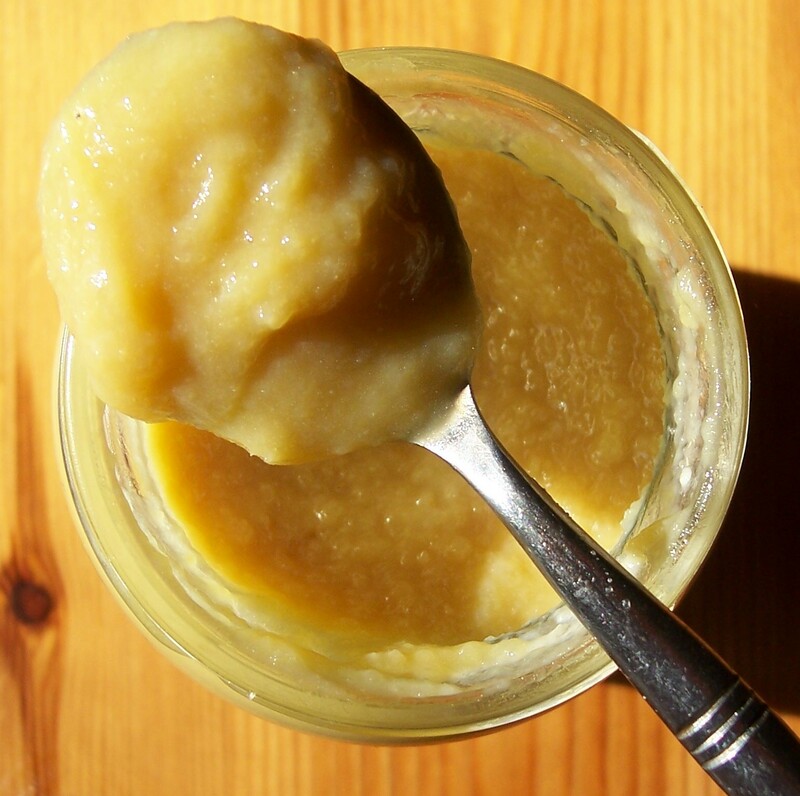 Having made Crab Apple Jelly my recipe recommended that the remaining pulp in the jelly bag be made into Crab Apple cheese, a thick sweet puree, so never one to be wasteful I gave it a go. Fruit cheeses can be so thick that they can be turned out with slices cut from them and were a feature of Victorian dinner tables. Crab Apple cheese was eaten at Christmas time as a dessert, studded with hazelnuts and decorated with whipped cream, alongside a second dark coloured cheese made from Damsons. 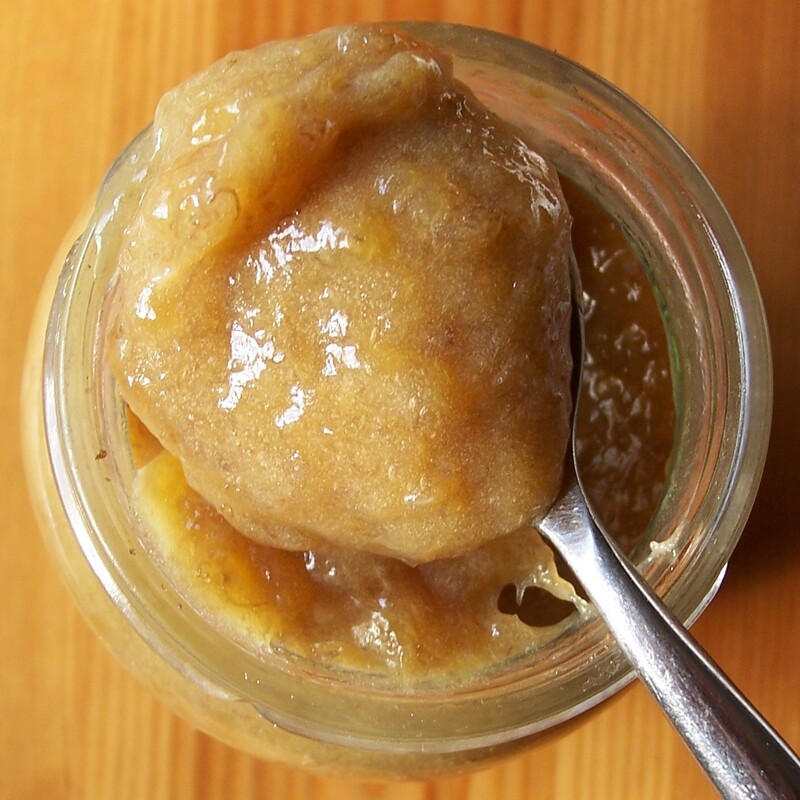 As with apple sauce, it can also be served with cold meats. The instruction was to sieve the apple pulp to remove the peel, cores and seeds. These had not been removed as they were necessary to give a high pectin content to the jelly. There was a sizeable amount of pulp but sieving the pulp was very time consuming and in the end I gave up. I think an old fashioned mouli blender may have been more successful (the sort that used to be used before the advent of liquidisers and food processors. In the end I opted to remove the pieces of peel, which thankfully were quite large, by hand, taking out any large pieces of core and seeds as well. Then I used my metal potato masher to turn the whole mixture into a puree. The recipe, as with the one for Crab Apple Jelly, was from The Penguin Book of Jams, Pickles & Chutneys by David & Rose Mabey. The resulting puree was very sweet indeed. We ate it with pork but we have also found it is equally as good eaten as jam. I think it would be good spread on slices of bread and made into a Bread & Butter Pudding. This version is simply apple and sugar, with no other flavourings as recommended by the original recipe which said the wonderful flavour of the apples would speak for themselves. I have seen other versions which are flavoured with cinnamon or ginger. Would I make this again? Probably, just because I don’t like to see waste, however I would have to think of a way of making it less time consuming, perhaps by removing the peels, cores and seeds but still cooking them in a small bag within the jelly bag, possibly. I wonder if anyone reading this has had a similar experience and how they solved the lengthy sieving process? Your comments and thoughts would be welcomed! Straight sided jars, or similar, so that the cheese can be turned out. 1. After making the Crab Apple Jelly, turn out the puree in the jelly bag and sieve to remove pips and skins. These are laborious to remove but it is important that they are included in the mixture as they add to the flavour. 2. For each 1lb/545g of pulp weigh out 1lb/545g of sugar. 3. Discard the peels and pips and place the pulp in a saucepan. Stir in the sugar and cook until it is dissolved. Cook until very thick. 4. Wash the jars well and sterilise. I usually do this by filling the jars with boiling water and putting the lids in a bowl of boiling water. I pour away the water just before filling each jar and immediately take the lid from the bowl and screw it on. Shake as much water from them as possible before filling. 9. Pot into the prepared jars. Cool and label. The cheese should be kept for several months and may shrink slightly in storage, which is normal. Serve as a dessert or with cold meats. On a bright and sunny mid September day my eye was drawn to a small tree of what I thought were probably crab apples, but not a variety I had ever seen before. They were the size of small plums but the colour of pale red cherries, the tree thick and the ground carpeted with the fallen fruit. This same day we had made our annual trip to Plum Corner, this year sadly (and literally) unfruitful, so there were containers in the car which I filled instead with the fallen crab apples. Some research when I arrived home indicated that this was a variety of Crab Apple (or Malus) called ‘John Downie’. I don’t remember seeing such pretty crab apples before, usually the ones I see are yellow ( a variety called ‘Golden Hornet’). I also read that the best place to gather the fruit was, as I had done, from the ground. My initial intention was to extract the pectin to help with jam making, however I also planted some of the fruit. Eventually I wouldn’t mind my own little tree, though I’m not worried about growing one that would yield enough fruit for cooking purposes! Expecting the liquid to be very sour I was pleasantly surprised at its sweetness, with just a slight sharpness, once it was strained through the jelly bag so I wondered if I could use it for something other than just pectin. 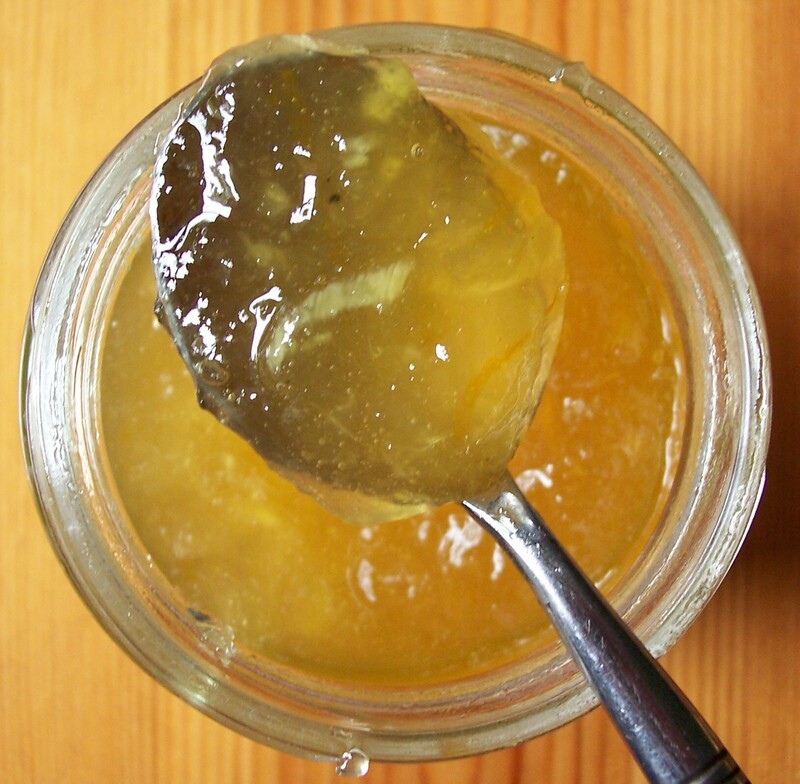 In The Penguin Book of Jams, Pickles & Chutneys by David & Rose Mabey there was a recipe for Crab Apple Jelly where the resulting fruit pulp could then be turned into Crab Apple Cheese. As I love the idea of wasting nothing I had to give it a go, retaining just a little juice for pectin for my jam, which I froze. This variety of Crab Apple gives a jelly that is fiery red in colour and other varieties will give different shades, but all are delicious with pork. My only complaint about the jelly is the inevitable small yield from what seems a good quantity of apples, but this is the case with any fruit jelly product. Under no circumstances should you be tempted to squeeze the jelly bag to extract more juice, as you are aiming for a clear jelly and the squeezing will make the juice cloudy. In the end be thankful for the small amount you get. Just enjoy its wonderful colour and clarity. 1. Collect a good amount of apples and wash them well. 2. Chop them up without peeling or coring and put them in a large saucepan with a very small amount of water (just enough to stop the apples from burning and sticking to the pan). Cook over a gentl heat until they are soft, stirring occasionally. 3. Stretch a jelly bag over a jug and spoon in the apple mixture. Suspend the jelly bag above the jug and allow to drip at least overnight, but preferably for 24hours. Do not squeeze the contents of the bag at any point or the juice will become cloudy. 4. Reserve the apple pulp for crab apple cheese, if you wish. 5. Measure the strained liquid and weigh out 1lb sugar for each pint of strained juice. 8. Wash the jars well and sterilise. I usually do this by filling the jars with boiling water and putting the lids in a bowl of boiling water. I pour away the water just before filling each jar and immediately take the lid from the bowl and screw it on. Shake as much water from them as possible before filling. 9. Pot into the prepared jars. Cool and label. I came across this at Tinyinc where it was called Marrow & Ginger Jam, but I have renamed it: the jam was very gingery and very lemony (but so ‘un-marrowy’)! I made just a few small tweaks to the original recipe. Firstly, I weighed the marrow and used this as a measure for the other ingredients using 1 lemon and 30g root ginger for each 40-45g unpeeled marrow/courgette and sugar equalling the weight of the marrow/courgette). 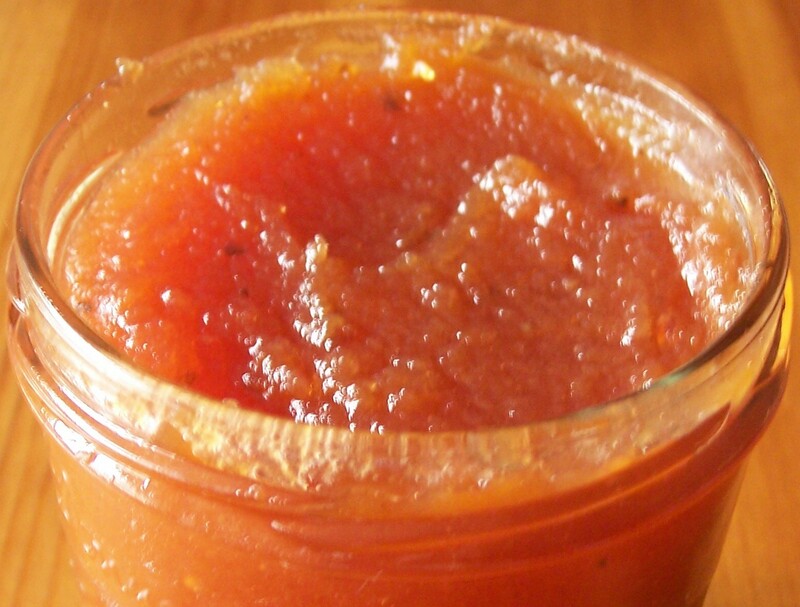 Secondly, as with Tinyinc’s recipe, I did not want lumps of vegetable in my jam so I liquidised the marrow down to a puree, which made it silky smooth, apart from the ginger and lemon shreds. Thirdly, I grated the ginger and added the outer peelings to the bag containing the lemon pips and shells. I find a bag made from the (clean!) knotted foot of a pair of old tights makes a really good alternative to my muslin bag which would have been far too big for this. Fourthly, I used ordinary sugar without added pectin with no setting problems. I did wonder if it needed some apple to help the set, but risked a batch without finding it set easily. This is a wonderful jam, with a translucent yellow colouring not dissimilar to lemon curd, which I know will become a family favourite and I can see myself making again and again. Tinyinc advised that the flavour matures and intensifies if the jam is stored first (which may prove difficult). 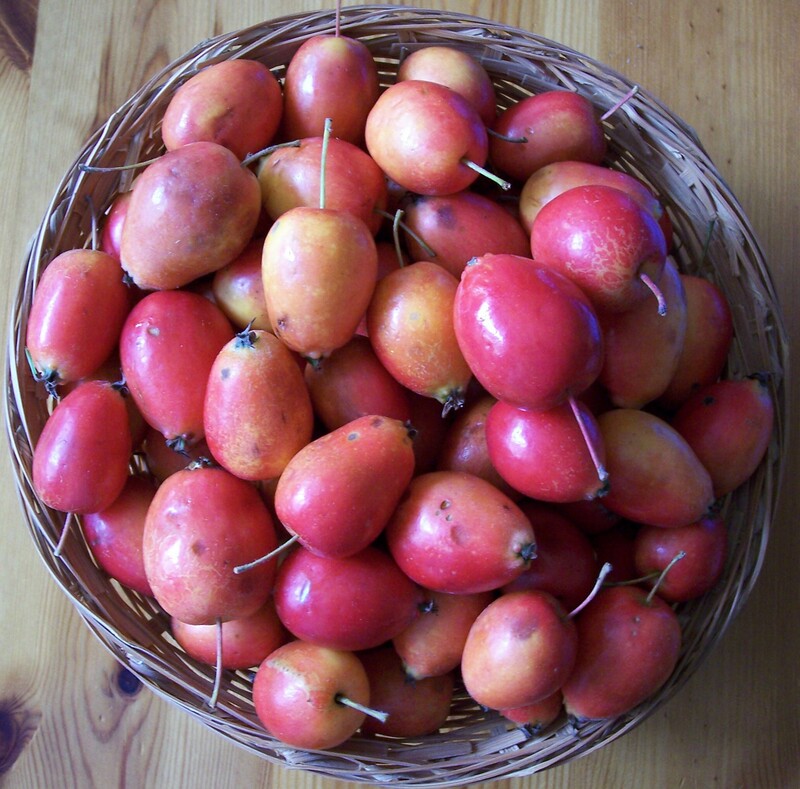 As for uses, apart from spreading on bread or toast, (a good alternative to ginger marmalade), tonight I stirred some into yoghurt with some lightly poached figs (apple, pear or plum would be good too) – it would also be delicious as a cake filling. 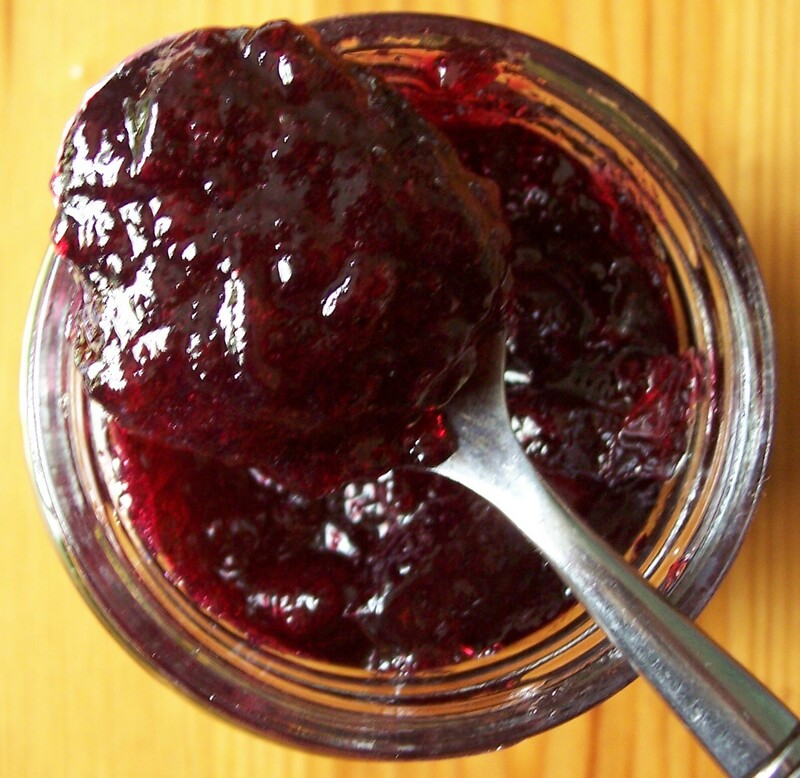 When you have made this jam, don’t tell people the secret – see if they can guess – surprise them! Weigh the marrow/courgette first and adjust the recipe proportionately: 1 lemon and 30g unpeeled ginger to 40-45g vegetable. The weight of sugar should be the same as unpeeled marrow/courgette. The quantities below are those specified in the original recipe. 1. Put two or three saucers in the freezer. (These will be used to test to see if the jam is cooked enough to set.) Peel the marrow, remove the seeds and cut into small dice. Place in a large saucepan. 2. Remove the lemon zest using a zester, if available, or the large holes of a grater (being careful not to remove any white pith) and set aside. Cut the lemon in half and squeeze into a jug. Place the empty lemon shells and pips into a small muslin bag (or foot section of a clean pair of tights). 3. Add a small amount of the lemon juice to the pan, cover with a lid and gently cook the marrow until transparent. If necessary add some more lemon juice to stop the marrow sticking. Spoon the marrow and any collected liquids into a blender and liquidise until smooth. Alternatively the mixture can be mashed for a slightly coarser texture or, providing the dice are very small, left as it is. 4. Peel the ginger, grate using the large holes of the grater and add to the lemon zest. Add the ginger peelings and any very fibrous pieces to the small bag with the leftover lemon pieces. 5. Return the marrow mixture to the same pan, add the remaining lemon juice, the lemon and ginger. Stir in and dissolve the sugar. Knot the bag of bits and add it to the pan. 7. Wash the jars well and sterilise. I usually do this by filling the jars with boiling water and putting the lids in a bowl of boiling water. I pour away the water just before filling each jar and immediately take the lid from the bowl and screw it on. Shake as much water from them as possible before filling. 8. Remove the small bag of bits, scraping the jam from the outside and squeezing it with tongs and place it on a saucer. Any extra juices that collect on the saucer should be stirred back into the jam before you start potting. Last year I wrote about our chance find of damsons in a hedgerow on a lane in rural Oxfordshire and subsequently turning them into Spiced Damson Chutney. We determined to return to the spot this year in the hope of picking them again but were disappointed to find, as we were a week or two later, they had all been either eaten by birds or taken by someone else – or possibly it was just not a very good harvest this year. Some you win, some you lose! However, all was not completely lost as, wandering along the hedgerow, I discovered a good crop of sloes and filled several boxes. Last year I made Sloe Gin in time for Christmas (now is the time, by the way – there may just be some left in your area and they can be frozen). I picked some Sloes for my parents and then wondered what to do with the remainder as, having some in the freezer already, I didn’t really have space for any more. This recipe from The Penguin Book of Jams, Pickles & Chutneys by David & Rose Mabey for Sloe & Apple Jelly attracted me. It is recommended for serving with mutton, rabbit or jugged hare and although we don’t eat hare, I do like both lamb and rabbit so it seemed worth a go. I think it would also complement duck, in a Chinese influenced dish with some added oriental spices. Duck in Plum Sauce is a favourite dish from the Chinese takeaway! On reflection, I probably should have used a smaller saucepan in the final stage. My only disappointment was that the jelly thickened quickly and was ready before I had prepared the jars. By the time the jars were ready it had cooled slightly and started to set. The texture would not win it any prizes, however the taste is delicious, which is what really matters. I would make this again, although using a smaller pan for the final stage and hope one day to post a better picture. The apple is needed as sloes are low in pectin so need it to set successfully. 1. Wash the sloes and if picked before the frost, prick them with a needle. I successfully crushed them in the pan with a potato masher. 2. Wash the apples and remove any bad bits and then roughly chop them. They do not need to be peeled or cored. Add them to the pan with sufficient water to just cover them. 3. Simmer gently until the fruit is quite soft, stirring occasionally and pressing more with a wooden spoon to encourage juice to come out of the sloes. 4. Strain the juice through a jelly bag suspended over a measuring jug. Do not squeeze the bag as this will cause the jelly to be cloudy. Leave for 24hours or at the very least overnight. 5. Dispose of the pulp in the bag. 6. This stage needs to be done before finishing the jelly which will reduce quickly. Wash the jars well and sterilise. I usually do this by filling the jars with boiling water and putting the lids in a bowl of boiling water. I pour away the water just before filling each jar and immediately take the lid from the bowl and screw it on. 7. Measure the strained liquid into a medium sized saucepan adding 1lb/454g sugar for each pint of liquid and bring to the boil. 8. Boil fast to set – a little placed on a saucer that has chilled in the freezer will wrinkle slightly when pushed with your finger. Pot into the prepared jars. Cool and label. Serve with mutton or lamb, rabbit or jugged hare, or with duck prepared with Chinese spice flavours. Oranges, being expensive to import, were considered a luxury around 200years ago when the tradition of marmalade making was first recorded. Seville marmalade oranges, which are small and slightly bitter, are available for just a few short weeks in the early part of each year and are not always easy to find: I usually look for them around my birthday in mid-February. Home made marmalade cannot be beaten, despite it being rather labour intensive, but it is definitely worth the effort. Just play some favourite music or find something good on the radio to make the squeezing and chopping more enjoyable. My book contains two almost identical recipes: a light coloured one, called Seville Orange Marmalade and the second, a variation of the same recipe, called Dark Seville Marmalade. I discovered in other books that this second one, which is much darker in colour and always chunky, is often called ‘Oxford’ marmalade as it was first made and sold there, being popular with the university dons and students. Followers of the Oxford v Cambridge University boat race will be aware that the team colours are dark blue for Oxford and light blue for Cambridge. 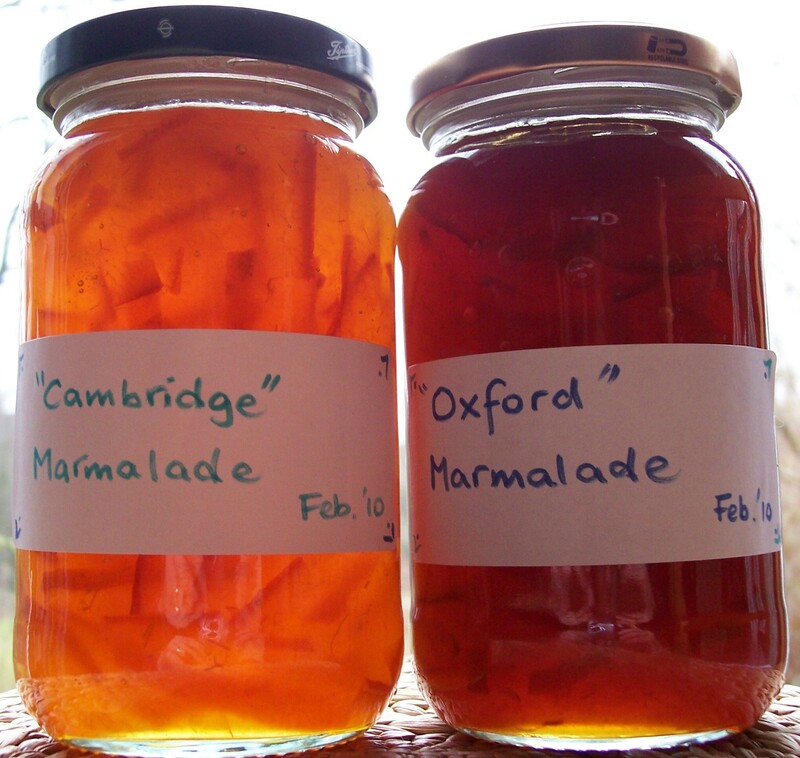 With this in mind, I have named the lighter colour ‘Cambridge’ marmalade, though I am aware that marmalade is not blue – or especially connected to Cambridge! The recipe, which I have adapted for both types of marmalade, comes from my well used jam and pickle book: Home Preserves by Jackie Burrow. I found that 1½kg/3lb of Seville oranges yielded a too large quantity for my biggest pan, so I divided the mixture between two big pans after the initial cooking time before adding half the sugar to each pan. (This involved straining off the cooked peel as well as dividing the liquid.) The treacle needed to give a darker colour to Oxford marmalade was added to just one pan. Some Oxford marmalade recipes also add root ginger, up to 60g/2ozs (depending on personal taste) is suggested for the amount of oranges in my recipe. 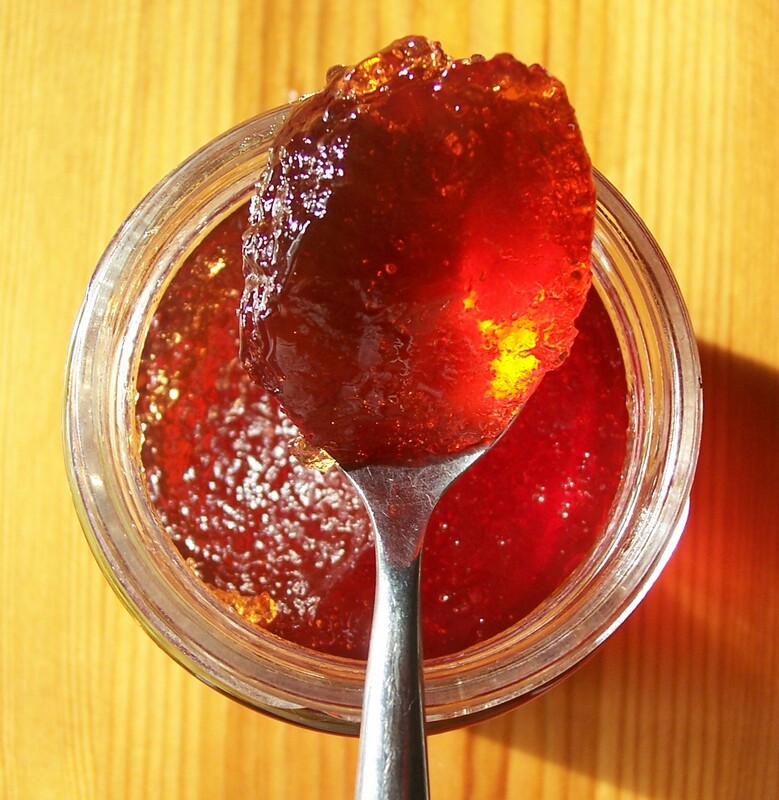 As with jams, marmalade cooked for too long can take on a tainted burned flavour. Dividing the mixture helped it to cook down to setting point quicker, so for this reason I may take this step again in future. Marmalade making is not a short job, so make sure you allow plenty of time. The original recipe said it would take 2 hours to cook but my total making and cooking time was nearer 5 hours, although this did include the time taken to divide the mixture into two pans, however once the marmalade is cooking it does not need constant watching. If you have freezer space, Seville oranges freeze well so they can be used at times when normally unavailable. 1. Wash the oranges and lemons, halve and squeeze out the juice and pour into a large pan. Put the pips into a muslin bag (I use the cut off foot and lower leg from a clean pair of old tights) and tie so it dangles into the juice in the pan. 4. Put some saucers in the freezer to chill. These will be needed when the marmalade is checked to see if it has reached setting point. 5. Add the sugar (and treacle if you are making Oxford style marmalade) and stir well over a low heat until dissolved. Boil rapidly until setting point is reached – a teaspoon of mixture placed on a chilled saucer will wrinkle when pushed with a finger. Remove any scum that has collected – some people do this by adding a knob of butter but I have not found it to be successful. 6. Allow the mixture to cool slightly before potting. While it is cooling, wash the jars well and sterlise. I usually do this by filling the jars with boiling water and putting the lids in a bowl of boiling water. I pour away the water just before filling each jar and immediately take the lid from the bowl and screw it on. 7. Pour into the prepared jars, cover, wipe if needed and label. I wanted to make Lemon Meringue Ice Cream and the recipe called for good luxury shop bought or home made Lemon Curd. Shop bought?! (Even if it is luxury.) 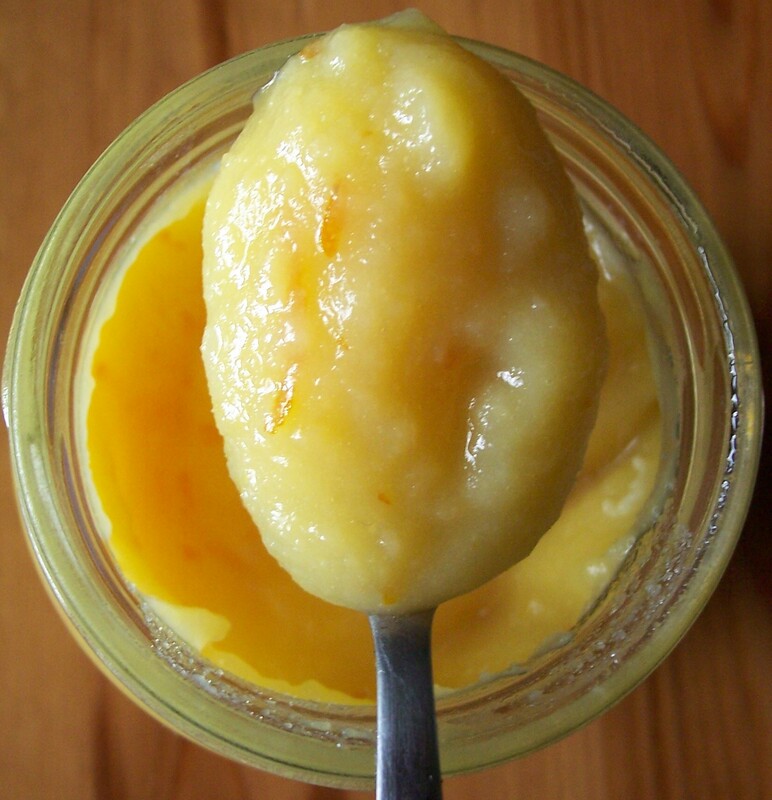 Lemon curd is so easy to make and I had the ingredients in the fridge so it was no contest. I’m surprised I don’t make it more often: it never lasts long! When I had used the half jar needed to make the Ice Cream we still had a good quantity to spread on bread or stir into yoghurt. You can make other citrus curds using the basic recipe: Orange Curd is a favourite and Lime Curd is lovely too (see below for more information on these). 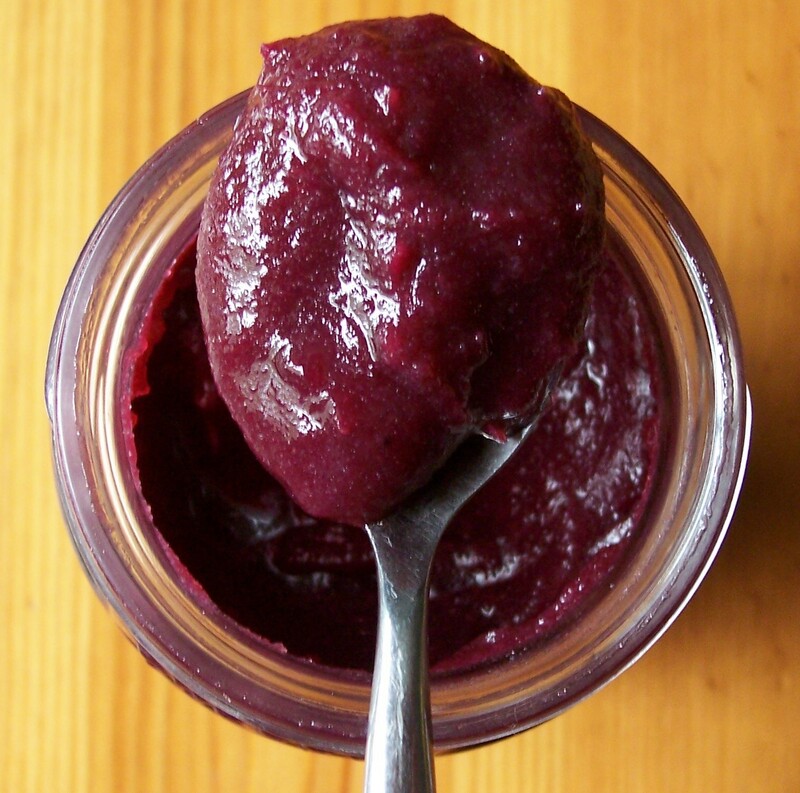 I’ve seen a recipe for Blackberry Curd which I would like to try as well (actually it’s blackberry and apple): another way to use some of the blackberries in the freezer that we picked earlier in the summer. 1. Wash the lemons well and remove zest with a zester or a fine grater, making sure that no white pith is removed. 2. Put the lemons in a microwave, if available, and give a short burst of heat (about 20seconds) which will help the lemons to yield more juice. Squeeze the juice from the fruit. a. Place juice, zest, sugar and butter in a bowl over a saucepan of boiling water or in the top of a double boiler. b. Simmer until the sugar is dissolved, stirring well. c. Allow to cool for 5 minutes. d. Add the beaten eggs and continue to simmer the mixture gently, stirring regularly, until the mixture has thickened enough to coat the back of a wooden spoon. a. Preheat the slow cooker for 20 minutes. b. Place juice, zest, sugar and butter in a saucepan until the sugar is dissolved. d. Add the beaten eggs and stir well. e. Place in a 1litre/2pt pudding basin covered with aluminium foil or a lid and place in the crock pot bowl. f. Add boiling water so it reaches half way up the sides of the pudding basin. g. Using the higher setting (my crock pot has high & low setting) cook for 1 to 1½ hours or until the mixture has thickened enough to coat the back of a wooden spoon. Method as for lemon curd, but substitute 5 or 6 limes depending on size. Method as for lemon curd, but substituting 3 to 4 oranges depending on size. 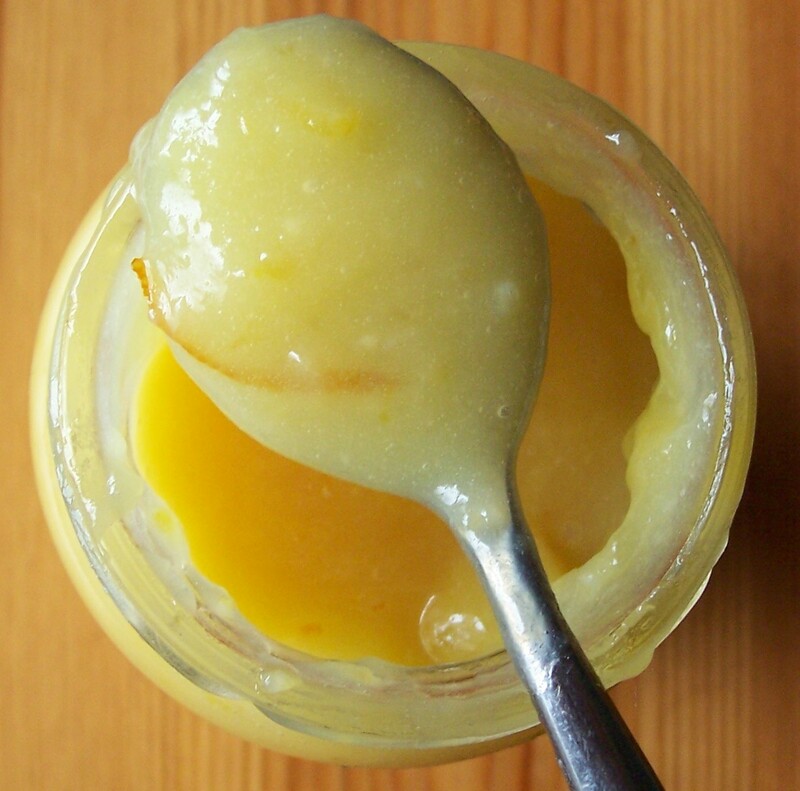 Method as for lemon curd, using 2 or 3 lemons and 1 or 2 oranges depending on size and the balance of flavour required. Method as for lemon curd, but replacing the 4 lemons with 4ozs peeled, cored & diced cooking apple and 12ozs blackberries stewed together and sieved, mixed with the juice of 1 lemon. The pectin in the apples helps set the curd more quickly so the yield is slightly higher: about an extra half jar of curd. I have also found recipes for the following curds, some of which will eventually appear here.